Garmin Foretrex 301 GPS device is worn like a watch on your wrist - perfect if you need GPS information and don't have a free hand to pick up and hold a handheld system. Featuring a black and white LCD (100 x 64 pixel) screen you can navigate your way back to any location as well as store waypoints along your route too. The waterproof Foretrex 301 has a battery life of up to 18 hours. You can save various routes (up to 20) and up to 500 waypoints to the device. Plus the Foretrex 301 allows you to share route and waypoint information wirelessly with other compatible Garmin GPS products. 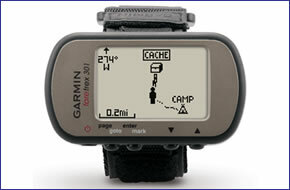 Garmin Foretrex 301 has been discontinued. Garmin Foretrex 301 is a small wrist-mounted GPS system designed for outdoor enthusiasts who need to use both hands as well as have the features that a GPS device provides e.g. trackable routes - making the Foretrex 301 ideal for hikers, climbers, skiers, solo sailing, etc. The Foretrex 301 features a black and white LCD display, which displays your route as a dotted trail on the screen so you can navigate back to any location/point thanks to the TracBack feature. You can save up to 500 waypoints/locations and up to 20 routes in the device so you can navigate back to them with ease. All this is made possible with a battery life of 18 hours with 2x AAA batteries (not included). Furthermore you can connect an optional heart rate monitor for use whilst on foot or a cadence sensor for use on a bike. The Garmin Foretrex 301 also has the ability to share information e.g. routes and waypoints wirelessly with other compatible Garmin models like the Foretrex, Oregon and Montana ranges. If you need a wrist mounted GPS device which also includes an altimeter and electronic compass, then you need to buy the Foretrex 401. The Garmin Foretrex 401 does everything the Foretrex 301 does but features an compass and altimeter as well. Do you have a question about the Garmin Foretrex 301 or other handheld GPS related question that's not been answered on this webpage? Please see our handheld and Outdoor GPS FAQs page for questions from other customers.Plus if the answer to your question isn't featured, use the online form to ask us for the answer. Alternatively please telephone 01733 777623 Monday to Friday (9:30am-5:00pm) to speak to one of our sales team.